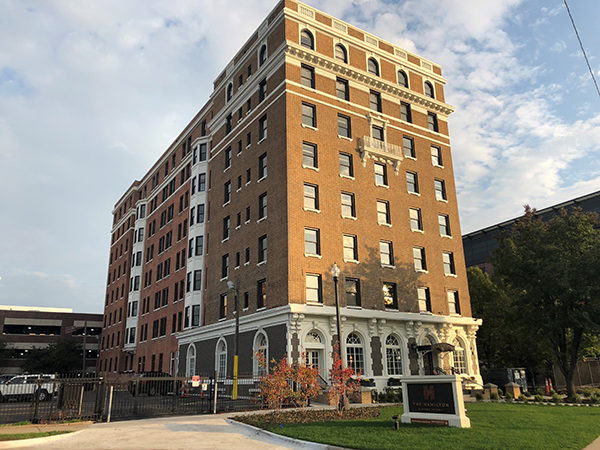 Detroit’s Broder & Sachse Real Estate Thursday celebrated the reopening of The Hamilton Midtown, a historic $12-million rehabilitation with an inclusionary housing program. The building was designed as a hotel and opened in 1913. Located at 40 Davenport near the Max M. Fisher Music Center, the building offers studio, one-bedroom, and two-bedroom units, with rental prices starting at $722 per month. The Hamilton is one of more than 250 Detroit properties listed on the National Register of Historic Places. Sachse Construction was the construction manager, and Hamilton Anderson Associates was the architect. The Hamilton Midtown includes a main-floor lounge with gaming and other entertainment, a living room with a coffee station, a fitness and wellness center, a dog washing station, and a bike repair station. The rehabilitation also included the restoration of the ballroom. Broder & Sachse worked with the City of Detroit and United Community Housing Coalition to create an inclusionary housing program for qualified residents. The program provided financial and relocation assistance to allow residents to temporarily move to other housing in Detroit. More than 75 percent of qualified residents will return to the building at an affordable rental rate. The building is near Wayne State University, the College for Creative Studies, Detroit Medical Center, and Henry Ford Health System. Broder & Sachse Real Estate was founded in 1993 in Birmingham, and has developed The Albert-Capitol Park, The Scott at Brush Park, and Orchestra Place, all in Detroit.